Acoustic liner is a highly efficient acoustic material, produced from strong resilient glass fibres firmly bounded together with a thermosetting resin. 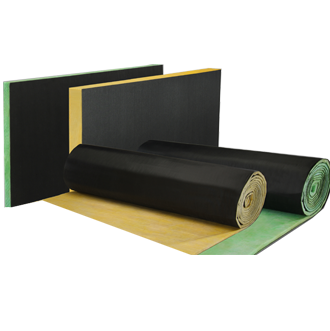 Acoustic liner is used to line air conditioning ducts, wall, and/or ceiling of acoustically sensitive areas to provide efficient sound insulation for any variety of structure, and/or sensitive facilities as home theatres or studios, curtain walls. Clean liner is faced with a black, strong, durable, dimensionally stable woven glass fabric. THERMAL PERFORMANCE: Tested in accordance with ASTM C518. ACOUSTIC PERFORMANCE: Clean liner is especially designed to provide exceptional sound absorption to acoustically sensitive environments and/or equipments as air-conditioning equipments, auditoriums, theatres, studios, acoustical building assemblies, curtain walls.